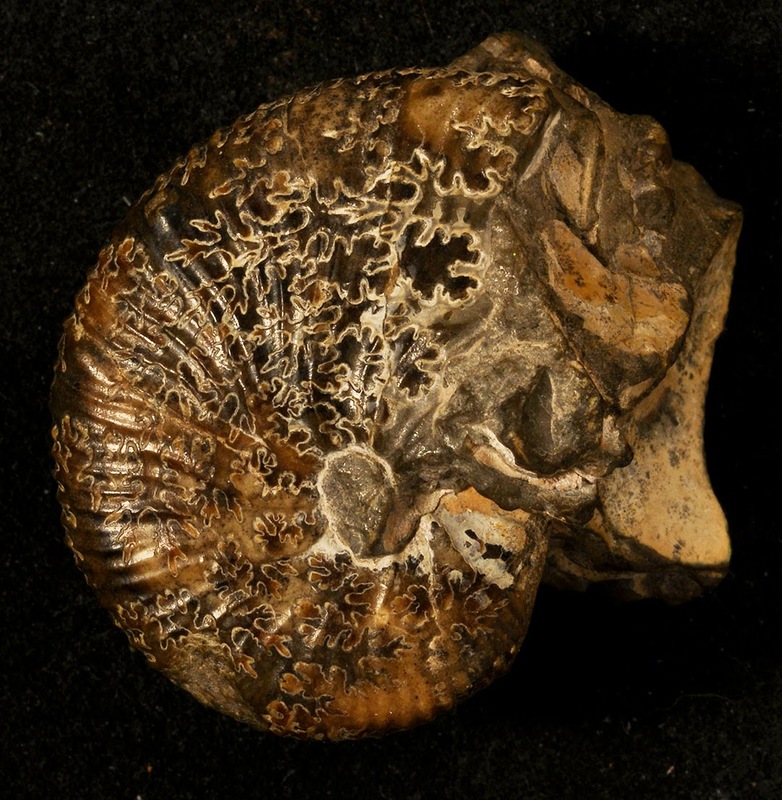 Ammonite shells are some of the most popular fossils for collectors. For a link that shows representative pictures of ammonites, click HERE. Ammonites were cephalopods (e.g., squids and octopus) that resemble the modern-day Nautilus. 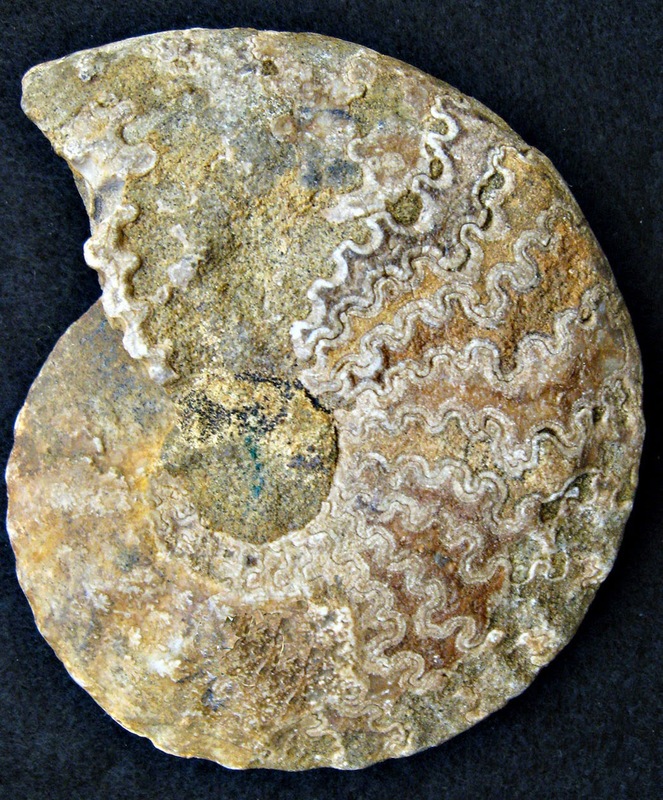 Like Nautilus, ammonites have curved partitions (septa), which divide the shell into chambers. The lines (sutures), which formed where the septa made contact with the inside wall of the shell, consist of distinctive curves that characterize different groups of ammonites. Sutures are only visible when the outer wall is removed or has been nearly stripped away. 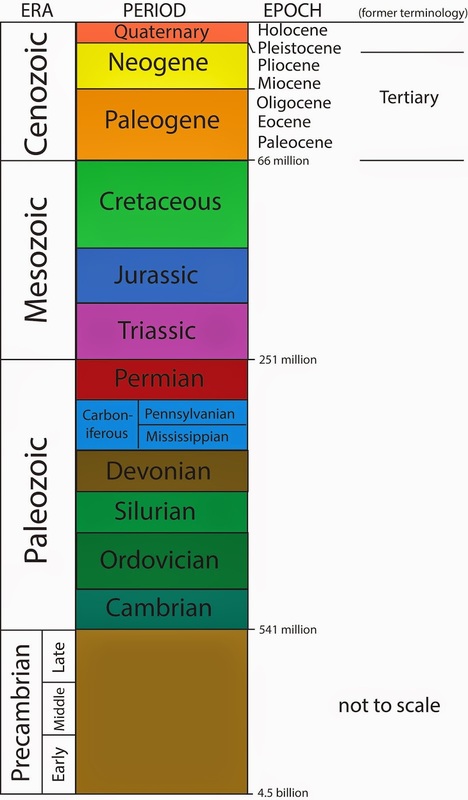 Ammonite sutures gradually changed (see diagram above) during the 250 million years through which they ranged; namely, from the Middle Paleozoic (Devonian Period) to the end of the Mesozoic (Cretaceous Period) (see diagram below). The ammonite sutures gradually became increasingly more complex, and these changes enable the paleontologist to use ammonite shells as "geologic clocks" for helping to determine geologic time. 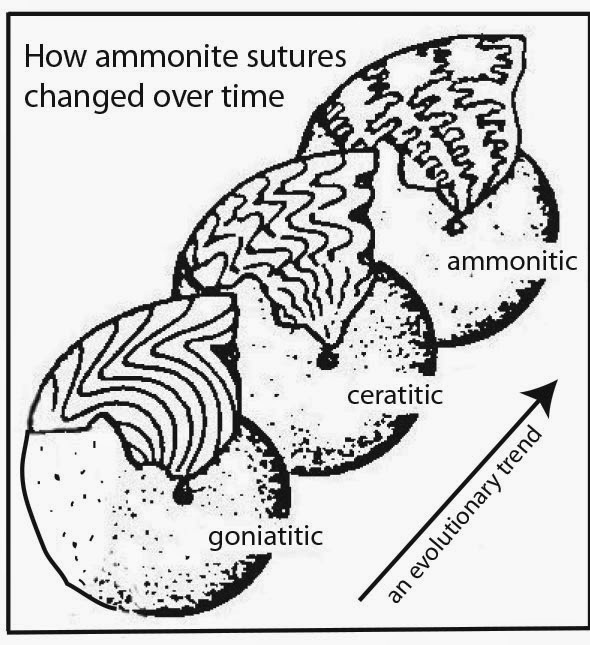 The gonitatic shells were the earliest (oldest) and the most simple; the ceratitic shells were intermediate in age and complexity; the ammonitic shells were the latest (youngest) and the most complex. The following pictures show a representative specimen for each type of sutures. This is an example of deeply undulating goniatitic sutures. 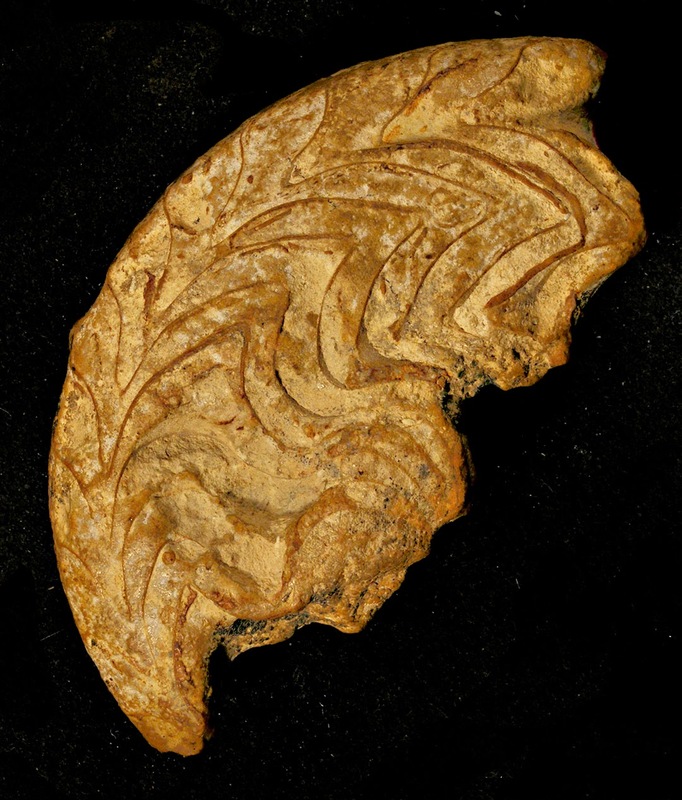 It is a partial specimen of Gonioloboceras coniolobum of Late Paleozoic (Pennsylvanian) age from Texas. The maximum dimension of this specimen is 6 cm. This is questionably a specimen of Uddenoceras of Late Paleozoic age. It is an example of ceratitic sutures. The maximum dimension is 9 cm. This is Hoploscaphites brevis? of Late Cretaceous age from Montana and is an example of ammonitic sutures. The maximum dimension is 3.25 cm. The shell shows impressions of its straight ribs, which must not be confused with the sutures. This specimen displays "mother-of-pearl" luster, which indicates that the preservation of the shell material is very good. You were right, I should have read this before our lab today! It's much clearer now. Thank you for posting! The suture lines found on these ammonites are quite fascinating and it's even more great that they are indicative as an index fossil. I hope to acquire an ammonite that displays each suture types. I really like the cretaceous sutures the most, so complex and interesting to why it is. Why did it change over the years? Maybe as a way to strengthen its shell with the interweaving style to add some sort of support? Something to study in the future.